Hi everyone. I’ve exported the vocab list into Anki but the problem is, when viewing the cards, it only shows me the English and the Pinyin, and the Hanzi is nowhere to be seen despite it being present in the actual card when ‘browsing’ it. 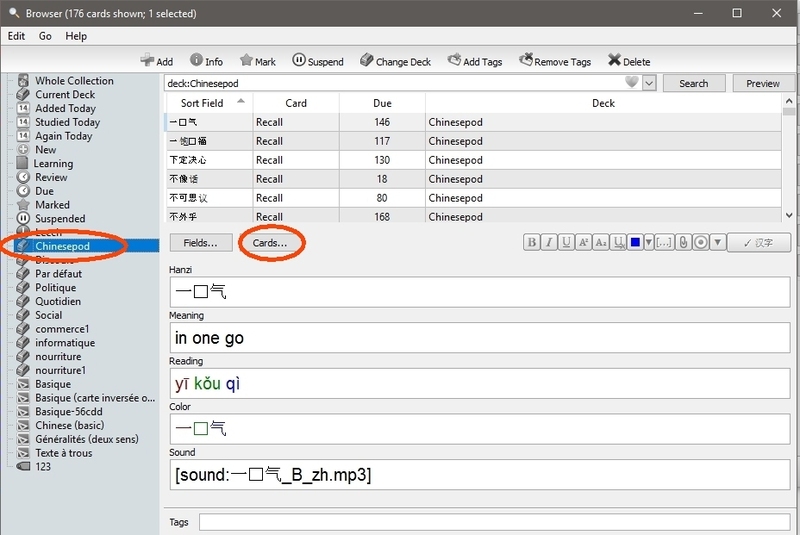 I’ve already downloaded the Anki Chinese plug-in and can successfully manually add cards to a deck that have Hanzi and they display correctly when studying them (i.e. : when the answers pops up for card, both the Hanzi and Pinyin appear) but the problem seems to only be with the ‘pre-made’ list I exported from ChinesePod. I’ve tried importing it as a Chinese Basic format and then again with Chinese Advanced format but neither solves the problem. Any suggestions to fix this please? 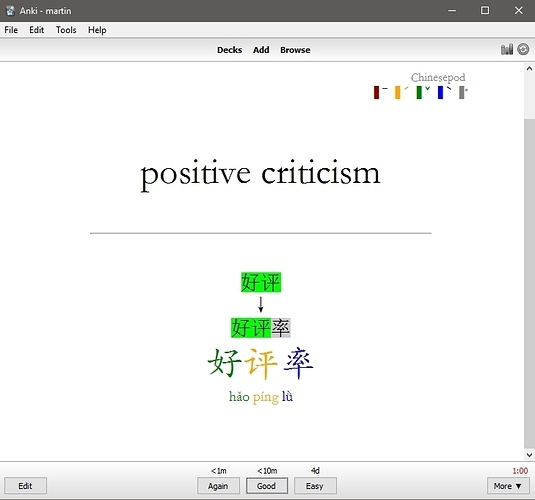 I have the ‘opposite’ problem exported vocabulary is shown in Chinese characters and English on the flipside. An standard solution which allows to show both, Chinese characters on the first side and English plus pinyin on the flip side? In an ideal world the export would include the mp3 files but I guess there is no solution for this, or am I (hopefully) wrong? 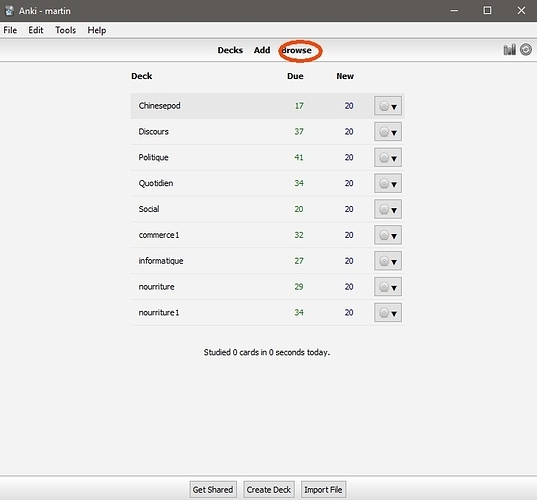 Anki is very good software, I do like it. 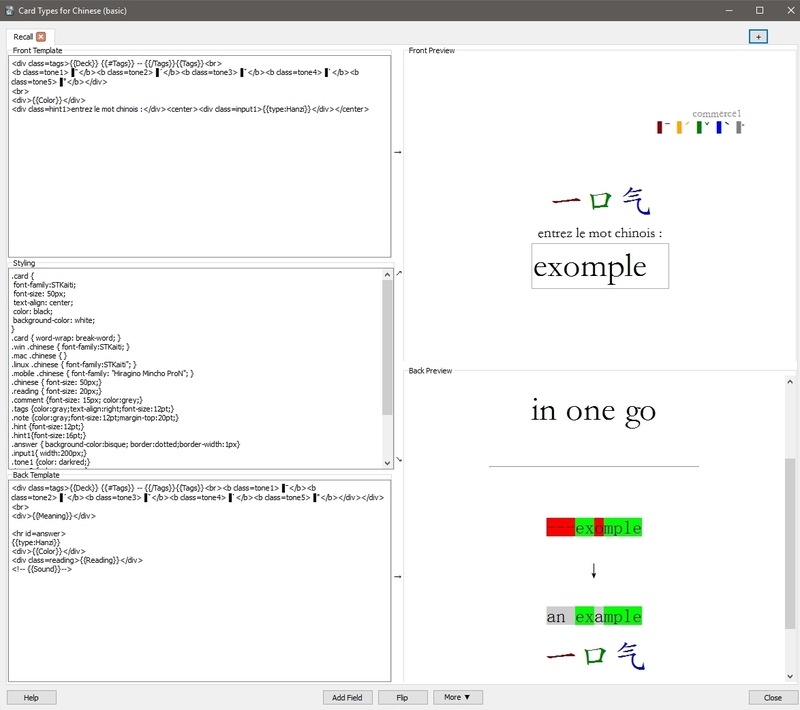 But apparently this software is written by professional software ingeneers, and that kind of guy have a logic which is not the same as common people. 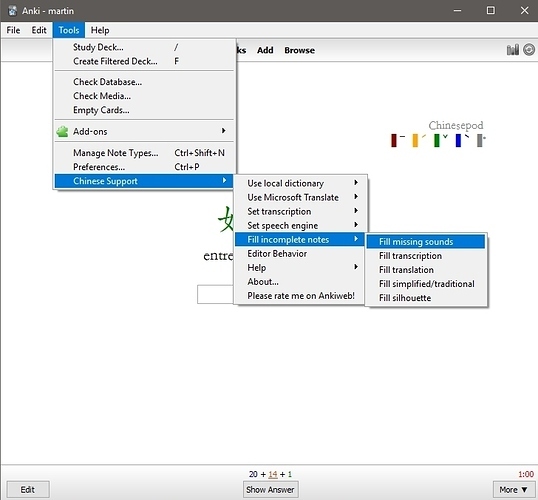 You can do evrything to personalize your anki but you have to modify some templates or code lines. So if you do not have any background on software 算了use it as it is. 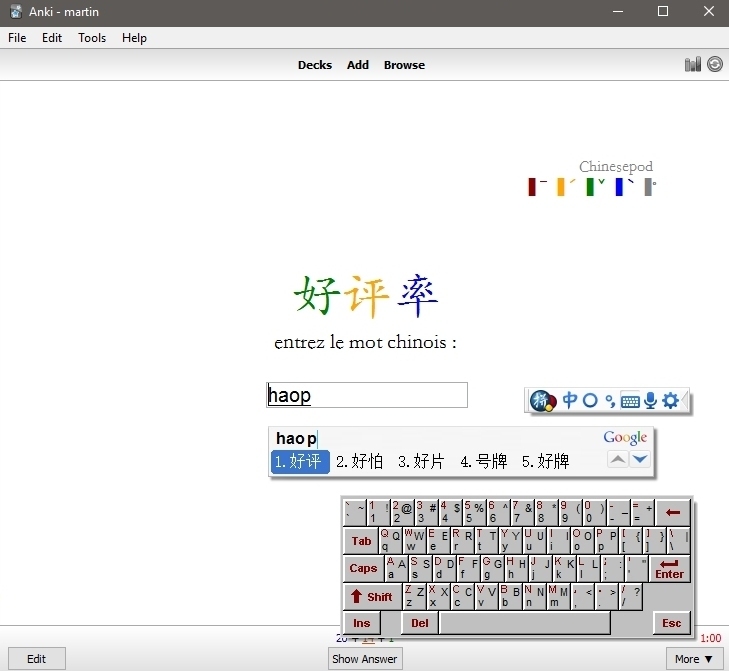 I have installed the chinese extension. On the styling part you can modify the font and fontsize. 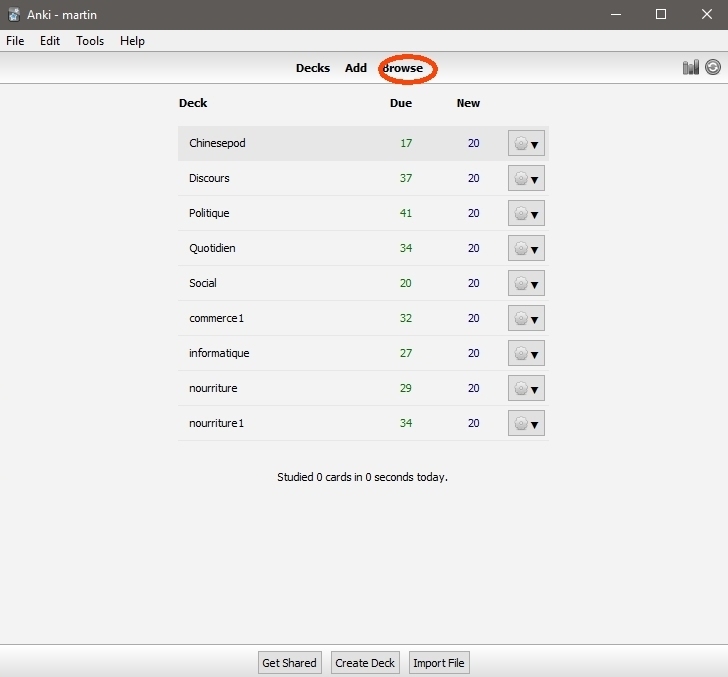 If someone create a deck for anki from a vocabulary list (which is a bit tricky) he can then export as a .apkg file (including mp3). Another user can just import that file with only one click . So if Chinesepod would do that and provide the apkg files it would be nice. Of course it is time consuming to do it for all lessons.